Welcome to the Musicfarm Homepage! Muhu Music Farm is located between Kuivastu ferry port and Muhu island Center (Liiva village), both are just 5 minutes driving distance away. Grocery store is ca 1 km away. Horseback riding options and seaside are nearby. weddings, birthdays or other company and social events. Muhu Music Farm is the home and birthplace of the internationally renowned jazz musician Villu Veski. Muhu Future Music Festival JUU JÄÄB - legendary international music festival, which first took place already in 1997, is organised here since 2015 at the outdoor playgrounds of the Muhu Music Farm. The Music Farm is also a summer concert venue in Muhu Island, where other concerts and summer events take place during the season. Muhu Music Farm has a long experience in organising concerts and events. For groups of 50 or more we can offer professional catering to impress your guests. including tables and chairs, sound equipment and backline. Muhu Music Farm is a summer concert venue in Muhu Island, where concerts and summer events take place during the season. Muhu Music Farm has a long experience in organising concerts and events. The very first concert here was given in 2015 by the talented American Jazz singer Hailey Tuck with her London 4tet. Since that many well-known Estonian artists and bands have performed here on the MusicFarm outdoor stage, of which few to mention are Jaan Tätte, Ivo Linna, Nele-Liis Vaiksoo, Olav Ehala, Ott Lepland etc, .
. 23rd Muhu Future Music Festival JUU JÄÄB takes place from June 20th to June 23rd at the outdoor playgrounds of the Muhu Music Farm. The JUU JÀÀB festival has been organised already for 23 years and is held at the Music Farm since 2015. 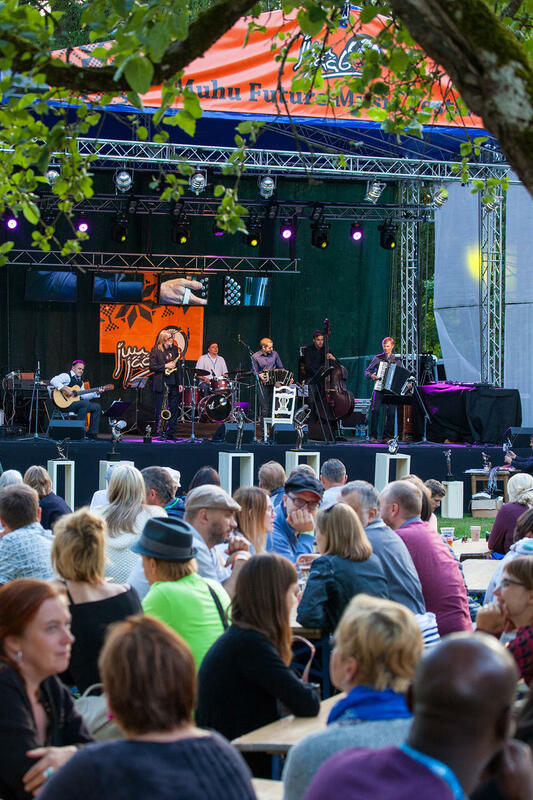 Juu Jääb Festival has an extensive programme of concerts, which are taking place also in other beautiful places of the Estonian Islands of Saaremaa and Muhu, but also in the cities of Tallinn and Tartu. In Muhu the other concert venues are Muhu St. Catherine Church and Pädaste Manor - both historically imporatant places for Muhu culture. The full programme of the festival takes place from 19th of June to 23rd of June 2019. Super Early Bird Passes available from December 2018. Early Bird Passes available from January 2019.